I am writing this on the very last day of my work placement here at the University of Edinburgh. 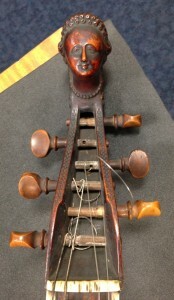 I have had an amazing six weeks learning about caring for the historic musical instrument collection. Many of the things I have learnt can be applied to other kinds of collection material but some things are very instrument-specific. So I thought I’d talk about some of those. 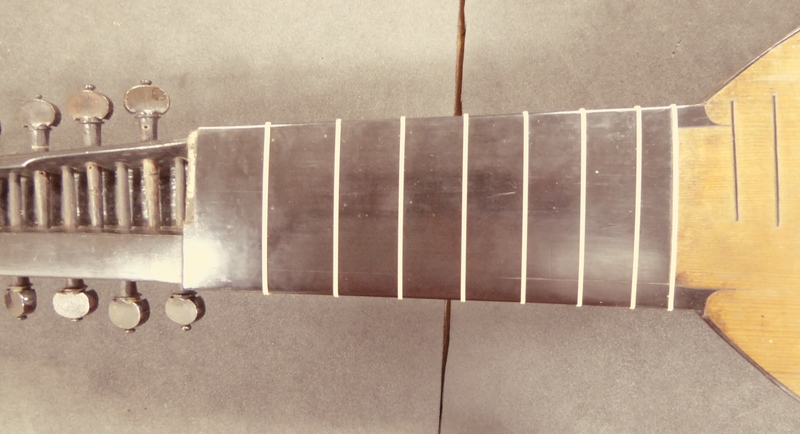 For example, I have learnt how to make frets from gut (the same material used for early strings) for 17th century string instruments. 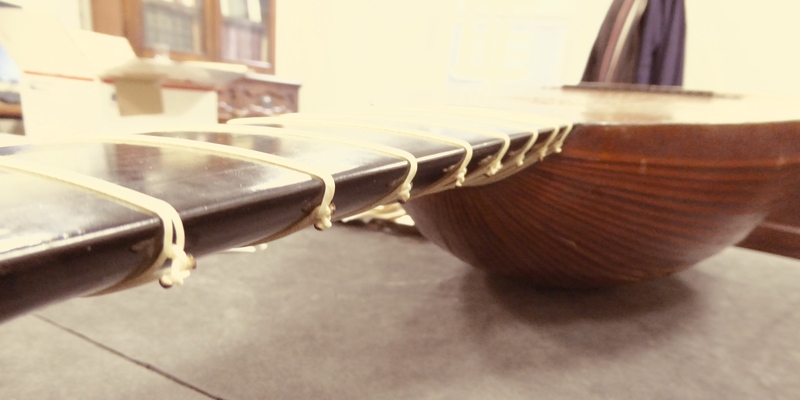 This involves using a special knot to tie the gut round the fingerboard, making it as tight as possible and sliding it to the right position, then burning the ends so it won’t unravel (and so it looks really neat). Fire is something I never thought I would use in conservation, so this was awesome! How to tie the fret knot. Image from Gamut Music Inc. Many of these instruments did have frets, and most people wouldn’t know (I didn’t) but it makes a lot of difference to the sounds they would have made. Also they did not have nylon in the 17th century! However, it’s not just about using the correct materials, but using them properly and wasting as little as possible. So when I put strings on a baroque guitar, the strings which have been made (by Gamut, an early music string maker) have a few extra inches that are not needed. 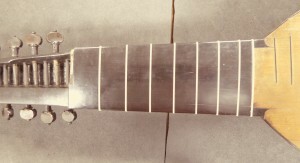 These few inches can then be used to make frets, for example. The knots at the bridge of a guitar or lute can be tied in many different ways, but the way we do it here is so that all the ends point downwards (when the instrument is held as if for playing) and are tucked away behind the bridge. Beautiful! 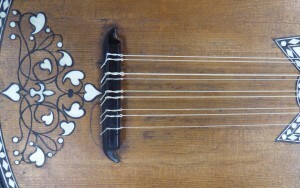 Baroque guitar with new gut strings, detail of bridge. 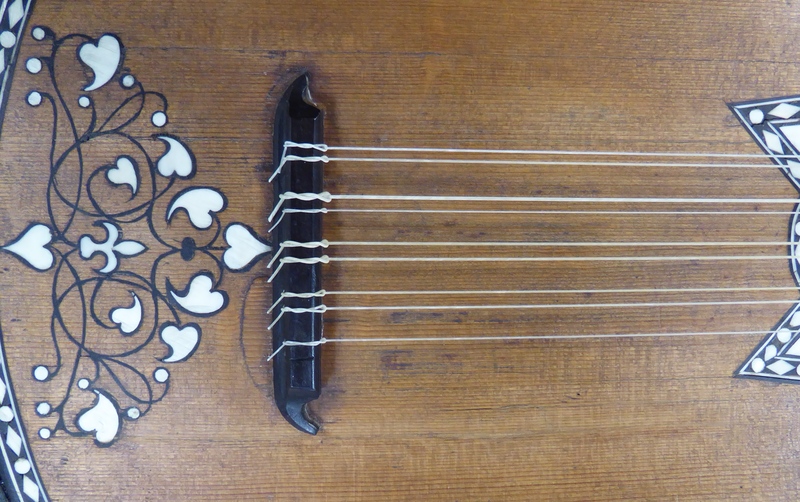 Check out that inlay! 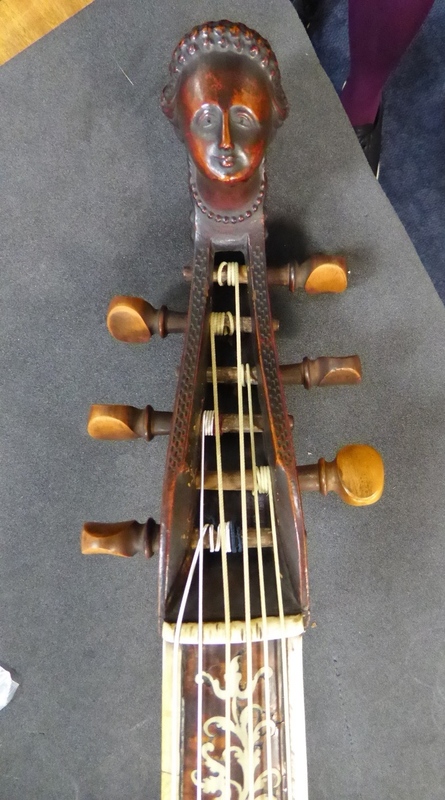 Last week I did a short presentation to show the CRC staff what I have been doing during this placement, which I rounded off with before and after images of the head of an instrument called a viola da gamba – the first string instrument I had the pleasure of working with. And the loveliest, I think. In Southampton I volunteer at the SeaCity Museum, working with their objects conservator who likes to personify things in the collection, describing a piece of newly consolidated Murano glass as ‘a lot happier’, or a rusty medieval sword as ‘not very well’. I think this can be applied nicely to the viola da gamba. 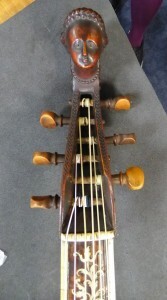 She looks great for a 319 year-old, and genuinely seems happier with her new strings. Why did you decide to apply for the internship at the CRC? What did you expect from the internship? Has anything surprised you? Tell us about what you’ve learnt over the past 10 weeks. 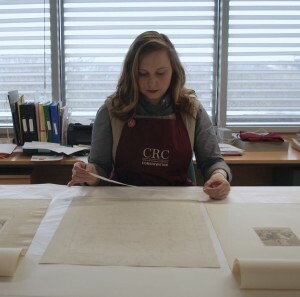 Can you describe for our blog readers a typical day within the CRC conservation studio? What have you enjoyed most about your time with us? What shall you miss about the internship? 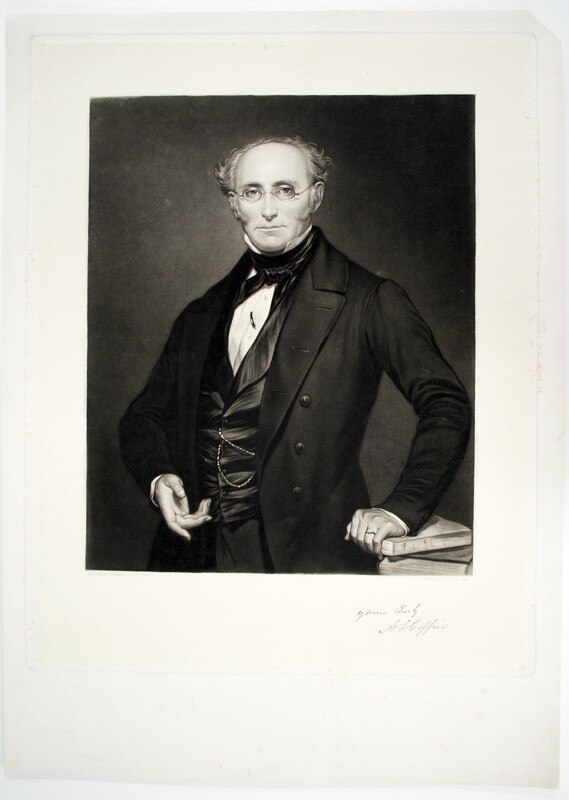 What advise would you give to the next intern working on the Thomson-Walker collection? 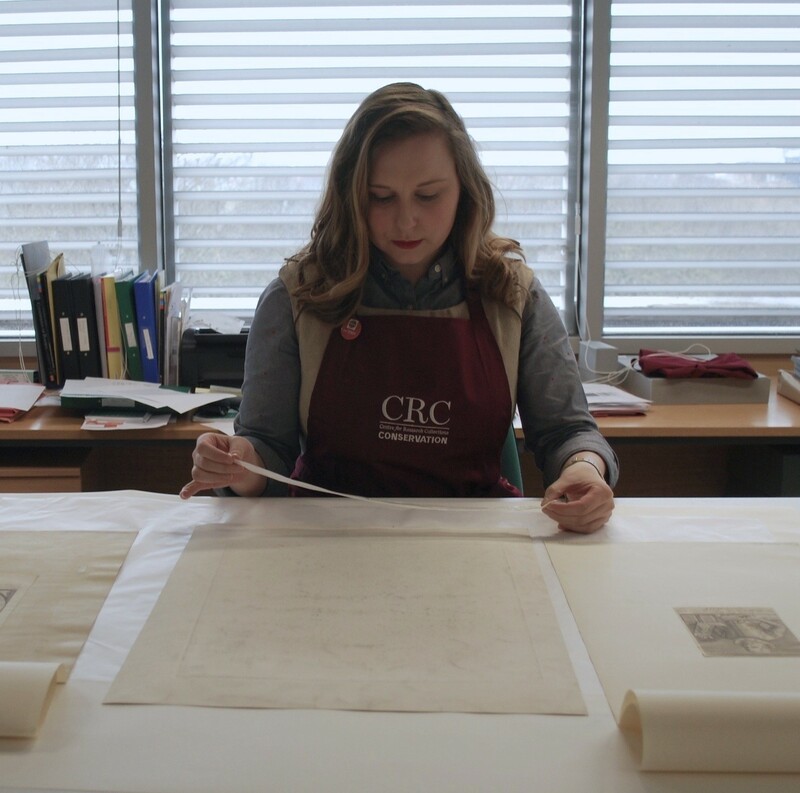 From all of us in the conservation studio, and the CRC as a whole, we would like to thank Samantha for all her fantastic work, and wish her the best of luck in her future career. In the meantime, we will be sure to keep you updated on how the Thomson-Walker project developments…. Last week, a contingent from conservation left their natural habitat of the studio to embark on a day trip up North. Stirling University was our destination, more specifically their conservation studio, in order to learn more about their special collections, and the conservation work they’re doing. Stirling University is currently part way through a Wellcome Trust funded project to conserve and re-house the records from the Royal Scottish National Hospital. Working on this project are conservator Elizabeth Yamada, with interns Kat Saunt and past University of Edinburgh conservation intern Erika Freyr (who you may remember from her work on the Laing project: http://libraryblogs.is.ed.ac.uk/conservation/2014/06/20/conserving-laing-iii/). We had previously been delighted to have had the chance to show Elizabeth, Kat and Erika our own studio at the Main Library and introduce them to the work we are doing and the collections we hold. We were therefore pleased to have the opportunity pay them a reciprocal visit and learn more about their own project. First stop was a visit to their conservation space, and to find out more about the project and their approach to conserving the Hospital’s records. Having converted an old bindery for use as a studio, space was at a premium and with so many records requiring attention, they certainly had their work cut out! The aim of their project is to stabilise the records – through surface cleaning, flattening, tear repair and rehousing – focusing on making them accessible to readers and researchers. It was interesting to learn about how they manage their time, and their thoughts behind deciding what level of treatment they should carry out. It was apparent that time, space and resource constraints made project management so important – something that many people, of all professions, will be able to identify with! We also had the opportunity to take a closer look at examples from both the University’s wider special collections and those from the Royal Scottish National Hospital. We got a fascinating, and sometimes harrowing, insight into the human stories contained within the archives and, the photographs in particular, gave a glimpse into the daily lives of those that were housed at the hospital. As conservators, we do not work in isolation and visits such as these are important in forging those links with other institutions and to learn how other studios and conservators work. It is a great opportunity to share knowledge and skills thus developing the profession as a whole.